They meet again. No. 19 Quinnipac heads eight miles down Whitney Avenue to face off against rival Yale for the first time this season. Its one of the more important games for the Bobcats as the ECAC regular season start to wind down. Both Quinnipiac and Yale are fighting for what likely will be the final ECAC first round bye as Saint Lawrence, Union and Harvard look to have control of the first three seeds. Right now as it is currently stands, Quinnipiac, Yale, Cornell and Clarkson are going to fight it out for the final playoff bye. Those four teams are separated by three points which shows you just how important this game against the Bulldogs is. Yale is one of the hottest teams in the country with a 6-1-2 run in the month of January to get back into the race for a top four spot after getting off to 2-4-2 start to begin the season. Currently 10-7-4, Yale has not lost an ECAC game since December 10th when they fell 5-3 to Union. The Bobcats have owned the Bulldogs in the all time series 15-6-5. Yale's last win against the Bobcats came in the 2013 National Championship game in Pittsburgh winning that game 4-0. The Bulldogs are getting great production from sophomore Joe Snively who leads the team in points with 26 (8 goals and 18 assists) but its the senior captain John Hayden (2013 3rd round, Chicago) who is coming into his own as a player. A season ago Hayden had 23 points in 32 games but his production this season has been greater with 25 points (16 goals and 9 assists) in only 21 games played so far. Of his 16 goals this season a staggering ten of them have come on the power play along with three game winning goals. Hayden is by far and away the player I would focus on if I was in the Quinnipiac's coaching staff's shoes. He has 107 shots on goal which is 53 more than the next Yale player. Keeping Hayden bottled up and limiting his shots would be a good way to give the team a leg up in trying to defeat the Bulldogs. Other forwards of note that Quinnipiac need to watch out for are junior Ryan Hitchcock 19 points (3 goals and 16 assists), senior Frankie DiChiara 14 points (7 goals and 7 assists) and sophomore Ted Hart 9 points (7 goals and 2 assists). Yale is averaging 3.14 goals per game which ranks them 18th in the country but they have one of the more impressive power plays scoring at a 21.43% clip (21-of-98) which ranks them 11th in the country. That is second best among ECAC teams behind Harvard which is the number one ranked power play in the country. It will be critical for the Bobcats to remain disciplined in this game to avoid giving the Bulldogs man advantage opportunities. Yale defensively in more of a middle of the pack team giving up 2.81 goals per game which is 31st in the country. Yale lost some quality defenseman in Rob O'Gara, Ryan Obuchowski and Mitch Witek to graduation. The Bulldogs also lost junior defenseman Nate Repensky to a career ending injury before the season. The injury left the Bulldogs with only two upperclassmen on the blue line yet only one of them sees consistent game action in junior Adam Larkin who has 11 points (3 goals and 8 assists). 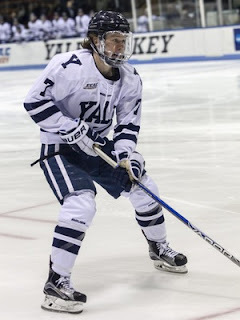 Yale has had to rely on many of the younger players to get experience on the fly and it has paid off in the second semester. With young players like Charlie Curti, Matt Foley, Billy Sweezey and Chandler Lindstrand starting to come into their own as players, the Bulldogs in the month of January have really tightened things up defensively to the tune of 1.88 goals per game. The Bulldogs penalty kill is 26th in the country at 84.4% (81-of-96) and they have given up six power play goals in their last nine games. Yale had to replace an All-American goaltender when junior Alex Lyon decided to forego his senior year and sign with the Philadelphia Flyers organization. His former backup Patrick Spano has done a real solid job filling the shoes that Lyon left. In 17 games played, Spano is 8-4-4 with a 2.39 goals against average and a .915 save percentage with one shutout. He has given stability in net for the Bulldogs which has been key for turning around their season from their early struggles. In Spano's last five games he has a goals against average of 1.40. Quinnipiac is 4-0-1 in its last five trips to Ingalls Rink with the Bulldogs last win coming on November 6, 2010 in a 5-1 win over the Bobcats. This should be a great hockey game between a pair of rivals with key ECAC points at stake for both teams. This is Yale's best chance to score a win against Quinnipiac since 2013 but don't expect the Bobcats to lay down without a fight even if this has not been a typical Quinnipiac season like the past four years. The players get up for games against Yale and expect a hard nosed effort by Quinnipiac on Saturday night.